I got up early for me and was out the door before sunrise, heading to Bombay Hook. After there, I went to the park at Silver Lake. This sunrise was awesome. I wish I was there 15 minutes earlier. I guess I should have gotten up at O dark 15! I was sitting on the road watching a tree stump in the water, waiting for the marsh hawk to re-land on the stump, when I looked up the road and saw this guy crossing it, carefully. I love the green here. 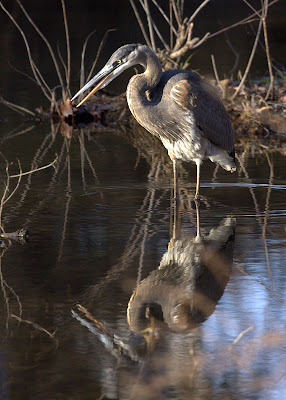 This Great Blue Heron was at Silver Lake Park. I was shooting pics of him for 15 minutes, till he flew into a tree and stopped fishing, plus my hands were cold!